There is an old saying that America and Britain are “two nations divided by a common language.” Most Britons do not believe Americans speak English; rather, they believe they speak American. Between British English and American English, there are variations when it comes to pronunciation, spelling, vocabulary and grammar. But this does not significantly affect communication. 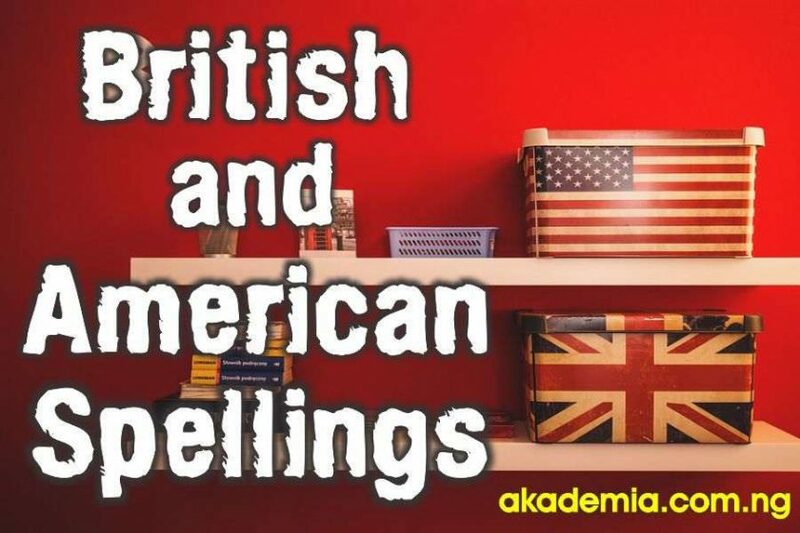 This post, British and American Spellings (Variations and Examples), takes a look at the issues of spellings as far as these two nations are concerned. The most striking variation between British and American English is the vocabulary. Many common words have different lexical representation in both languages. Most of the times, Britons and Americans rely on the context of the expression to deduce the meanings of words. Some of the areas where variations in vocabulary occur include collective nouns, verbs (auxiliary and past tense) and other aspects in which words conveying same ideas are totally different. You do not need to go home tonight. You needn’t go home tonight. American English favours simplicity in its spelling convention. It also pronounces words the way they sound avoiding double letters and supposed convoluted spellings which is characteristic of the British English because it retains the spellings of words that came into it via trans-lingual borrowing. We need to be conscious of these spelling differences between British and American English to avoid confusion and mix up. It is also important to maintain consistency in whichever version of the English one chooses to use. Noah Webster championed the effort to simplify American spellings. He succeeded to a great measure but could not completely change all the British spellings to American spellings. Americans substitute words with ‘-ae’/‘-oe’ in British spellings for ‘-e’ in their own spellings. See the examples below. The words on the left side are British spellings while the ones on the right side are American spellings. It is important to understand the spelling conventions of both British and American English to know what to write depending on either context. Students taking examinations like GRE (see Top GRE Words) must be conscious of American spellings. But in all, whichever spelling convention one chooses to adhere to, consistency is very important. You can check some images representing the different vocabulary of the two languages provided by the US State Department.